Unbeaten in test series, t20wc, one day wc, vb series etc can all be somehow attributed to dhoni’s luck ;). btw, which captain has won 3 world cups? India lost a match just last year to SA. The best winning streak India has had in Tests is 2 maybe 3 matches in 2010. Their best not loosing a match (includes win or draw) is: 7 in 2008 and 2009 which is not close to Australia who have had streak of 16 wins in tests twice – 1999 to 2001 and again in 2005 to 2008. Also, since 2009 where they have won India has played more matches at home than abroad – something India has not been doing in the past. Again, I dont want to degrade the test status or anything that India has achieved – simply conditions have been favorable for us in last 4 years and we have had a great team which has not changed in recent era. Something that even Ponting had at his disposal in last decade. This is not an individual effort and definitely our captain has not done enough “just yet” in adverse of the situations. All the “handle pressure situations” we have found ourselves in has been a result of bad planning. Sure, we came out well – but if we see some of the choices during the match and hear what some of the experts have to say (at this point I am not referring to my analysis), a lot of those dont make sense to anyone. Now we can say – all experts are wrong and Dhoni knows something that no one else does – I wont speak another word on this topic ever again. 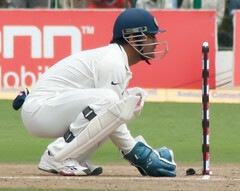 However, Dhoni sure has best that India has had – no questions asked and no caveats presented. And maybe it is not Dhoni’s luck – it is simply India’s destiny/luck and Dhoni is in middle of all of this just like every other player is. However, I see other players perform on the field and Dhoni is so patchy with his batting and wicket keeping. Even in the World Cup, everyone around me had lost hope he will do anything and then one day he hits a big one – he has been so inconsistent recently – now that is a result which we cant debate. WC is a classic example where until the elimination round, India was hitting itself in every pressure situation – England, Ireland, Dutch, SA – also 2 cases I can recall clearly were in bowling department where we went down in pressure. In elimination round we did good but it was all in batting department and in those too Dhoni went down to pressure in 2 matches against Australia and Pkistan. It was Yuvi and youngsters that got us thru. Finals – he did very well and he was brave or desperation to do something. Whatever it was is was good as the result was good. I was referring to Ponting who took Australia to 2007, 2003 and 1999. I checked and found 1999 it was Steve Waugh. So I am back to 2 WC and 25 match winning streak (1 match led by Waugh remainder by Ponting). 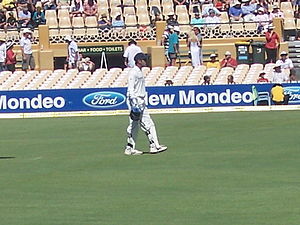 Yes he is Period.The stats say is all – 2007 T20 WC victory, #1 Test status and now prestigious WC in 2011. No one else has done it in the past. He is the first one to do it. Dhoni is the best captain India has ever had; but he is not the greatest. He needs to prove himself. This is just the beginning. He has the best team ever that India has played in cricket. I cant recall a time when India had a strong bench in every department – bowling , batting, fielding, all-rounders. This is the period when we have bench in every department and people who are capable of replacing one another. Australia saw some major retirements in last few years – Gilly, Hayden and may more. Pointing is not playing well. But Australia is no longer invincible. Everyone is beating them left-right and center. England beat them in Ashes in Australia. Why is Dhoni great? If this logic applies, every captain should be a great captain because Australia is no longer in shambles. We played in SA and lost 3-2. What did he do? Nothing. because he could do nothing. We do not perform well in foreign pitches and we did fail again. In last 4 years we have played more matches at home than abroad. Last 2 T20 WCs we did pathetic – why because they were not played in India. What has Dhoni did to improve the team to play well abroad. Nothing. Where is his foresight and captaincy. Bring Piyush Chawla in the squad when he was not performing. We had 2 spinners with same spin type who were performing better. Eventually the next series after WC Piyush has been dropped and others come in. 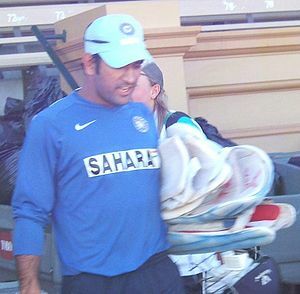 Then during the WC campaign, Dhoni quoted – “I am playing Chawla because he needs the match more than the team”. With Ashwin going into the SA without any match practice – is that a rational decision. Not but Ashwin did great and it was his capability and Dhoni’s luck. Remeber Chawla never played another match after that. Why did he need another game? Yuvi was in the squad for his vintage. yuvi was in no form for a WC squad and there were players sitting on bench in much better form. Where was his captaincy to call out lets sit Yuvi out (if not for the WC at least a match or two). But, he went with what was safe and took a chance. Yuvi was man of the series; lucky for Dhoni. But not a rational decision. I am happy that all is going well for India and I am happy for it. But, please stop propagating how “Great” Dhoni is. He is damn lucky and I am glad for it.Dhoni is where Tendulkar was in 1996 just starting to prove himself. He has at least 12 more years to go to show what he can do for India. Ponting did it for Australis over a long period and it is just getting started for Captain Cool. But it is a long road and I wish he does well and starts to do what makes sense; eventually luck will run out – Sachin, Yuvi will retire; Zaheer and Bhajji will loose their speed and turn. I would like to see what he does to prepare the team for that day. If we make Dhoni the captain of Bangladesh team he wont do that good, but he can be greatest given what he does around him with a sub-optimal team. Time will test him when great guns retire and it is then he has to come on top. It is then the luck will expire and leadership will come out. MI have led the points table for almost all of the tournament, until today when they found themselves loosing 2 matches in succession (first time this season) and in the process they are stranded on 3rd position and still not qualified. I posted a few days back some of the very interesting matches and how the tables stand, and a lot of those permutations are coming alive. Top 4 teams have all played 12 matches and standings are RCB, CSK, MI and KKR with RCB clear by 1 point (17 points); CSK and MI tied on 16 and KKR behind by 2 points on 14. KKR have bigger worries – KXIP winning all matches and tying on 16 points or maybe overtake them. With the following matches that can change the course of playoffs it is open table for RCB, MI and CSK. But the matches RCB has against KKR and CSK are the most important. I still do not have all of KXIP’s matches because I still feel they will loose their next match against RCB and then it will back to these 4. Also, the match against KKR and MI being the last one in this set may hold a huge bearing on the end and also knowing where they will be at that point. This is getting more interesting; will MI or CSK have a fairy ending tale?? So with today’s win RCB move to 2nd spot and equals MI and RR with the most consecutive wins in IPL. The top 4 teams have now played 11 matches and the standings are MI, RCB, CSK and KKR. With 3 matches to play, and separated by just 2 points (MI: 16, RCB: 15, and CSK/KKR: 14); they are playing for top 2 positions. In terms of matches RCB has the most difficult of matches and also the ones that will decide where they finish compared to CSK and KKR. Also, it will be a real test of their mettle against those teams. This dawned on me about 3 years ago. “What is the first emotion that you face, when you do not see something happening as you desire?” – when ever I have asked this question to a few people, the people the answer that I get is anger, dis-appointment, sadness, etc. I have felt the same way most of the time in my life. It was back then when I started to practice something that I like to call “negotiate with feelings” and a quick assessment now shows it has been particularly helpful. I try to isolate myself with an incident that has any impact on me. I just give myself some time to absorb what has happened. Sometimes, it takes a few hours and other times it may take a while. But once I am done absorbing, I clear my mind and start thinking what next needs to be done – remedies, action plan and ensure that I have that on track. The next step for me is to understand why it happened in the first place. I do not do a root-cause of everything; only those that had a big impact and I wanted to make sure that the chances of it happening ever again are diminished greatly. The result is not many times, I find myself “not getting angry” and understand why “am I dis-appointed” or “why am I sad”? and rather than holding on to the feelings for a longer duration and nurture them, I am able to go about providing a fix and get on with business as usual. It has also helped me as a person in certain areas because now as I have been able to negotiate with my feelings, it helps me in framing a more fruitful discussion with people.